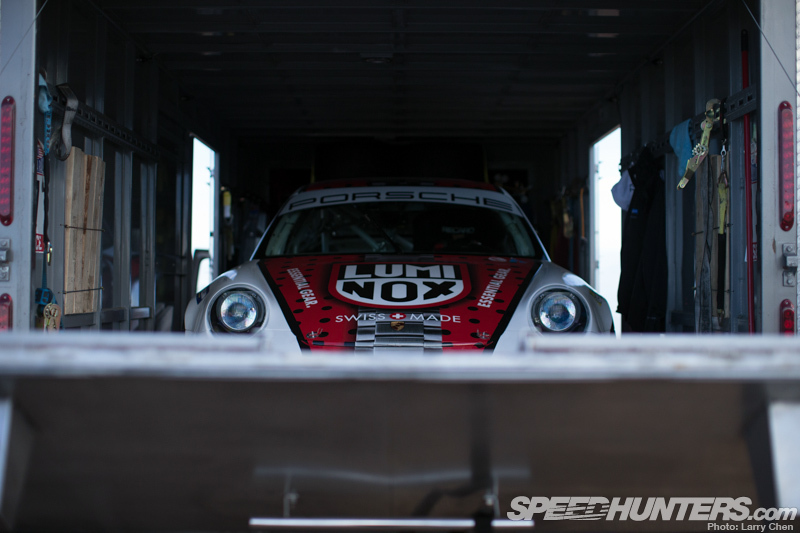 Deep down in our hearts we find the race car driver in all of us. 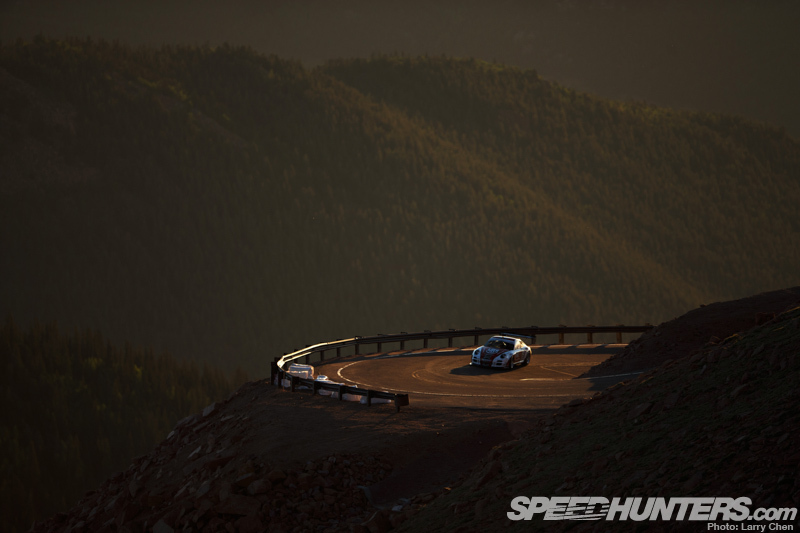 To satisfy the urge we play video games and we drive mountain roads, but for some of us it is not enough. Jeff Zwart is a working professional. 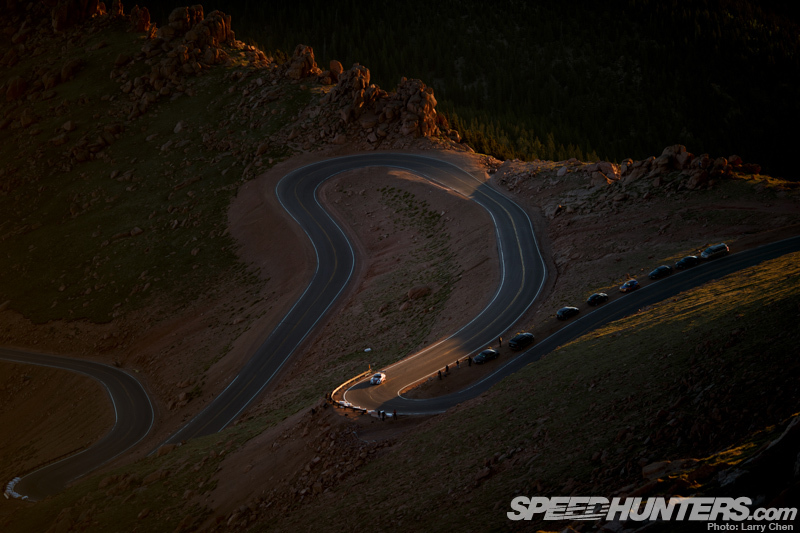 Like me he is a photographer and he started off his love affair with Pikes Peak from behind the camera. 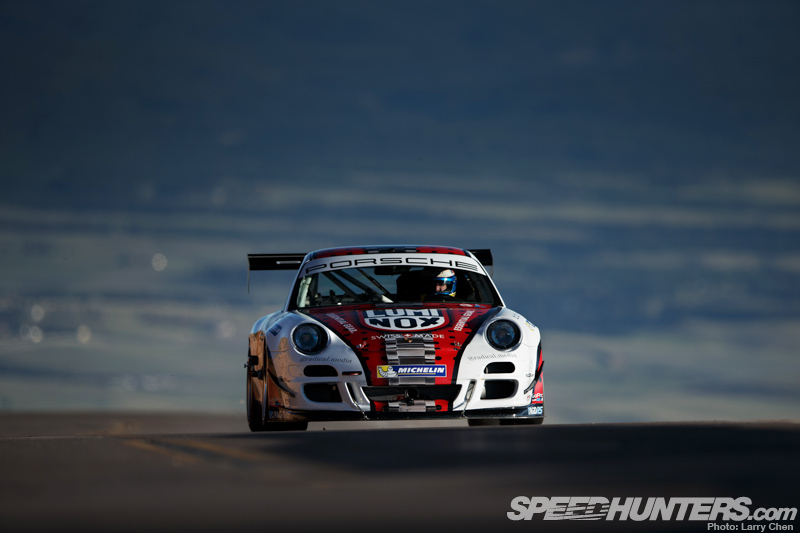 But for the past 14 or so years he has found himself behind the wheel of various Porsches, and tackling the Peak’s 156 corners. 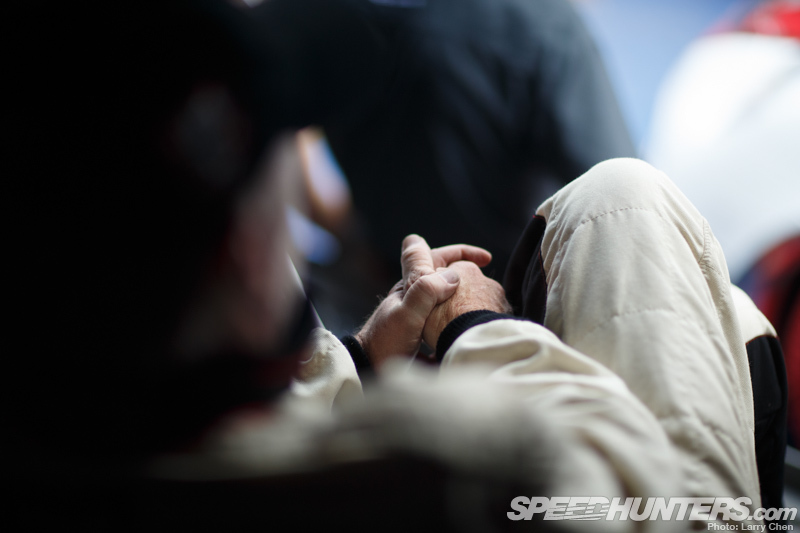 I sat down with him before race day to see what all the fuss is about from the other side. 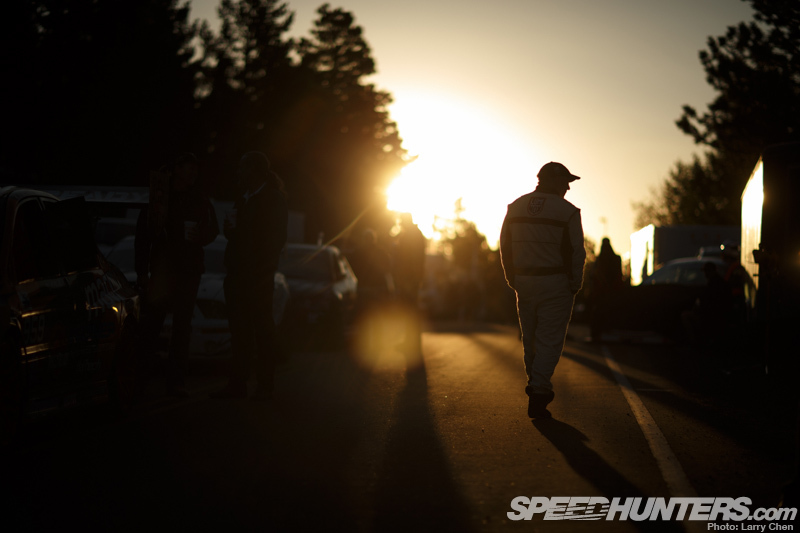 Larry: Ever since I started with Speedhunters everyone asks what event they should try to check out. 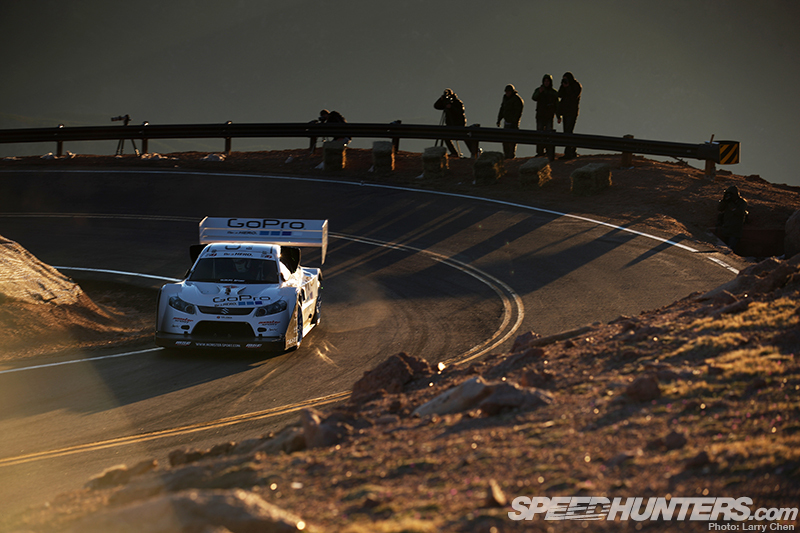 I always say Pikes Peak, because as a photographer and spectator looking from the outside it really is amazing. What about from a driver’s perspective? 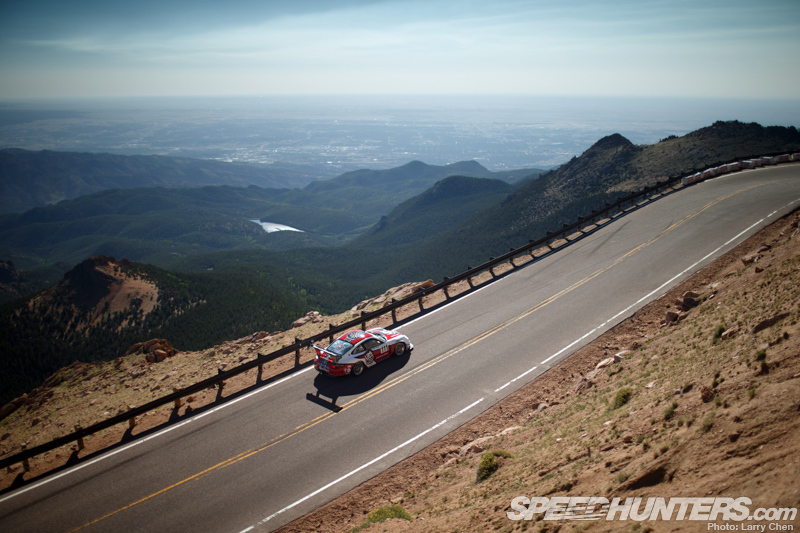 Why are you drawn to Pikes Peak? 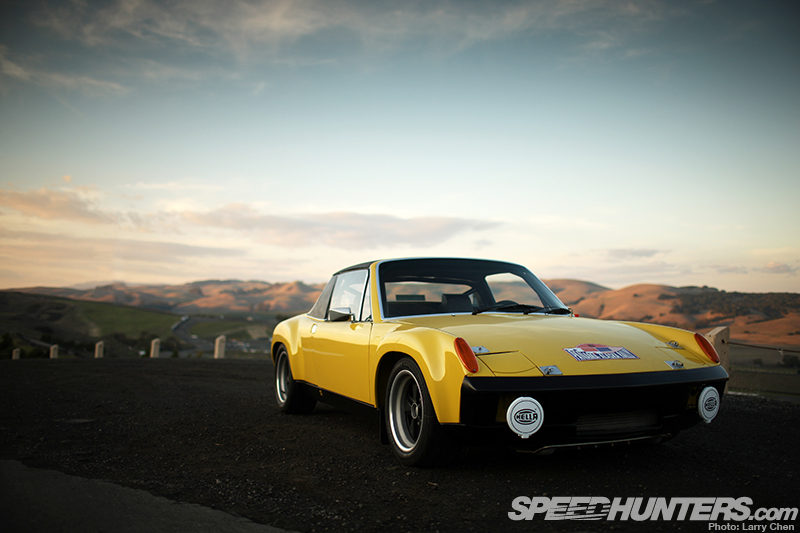 Jeff: My background was rallying. 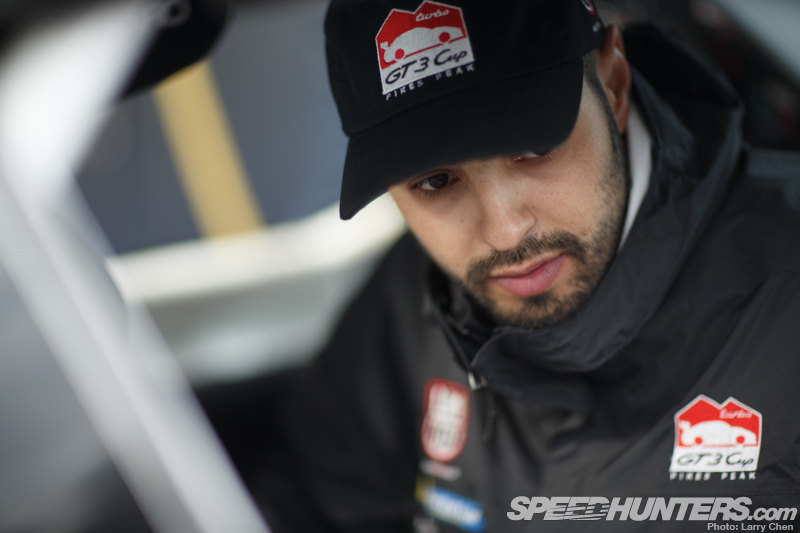 I loved rallying and ended up running in the US Pro Rally Championship for several years. 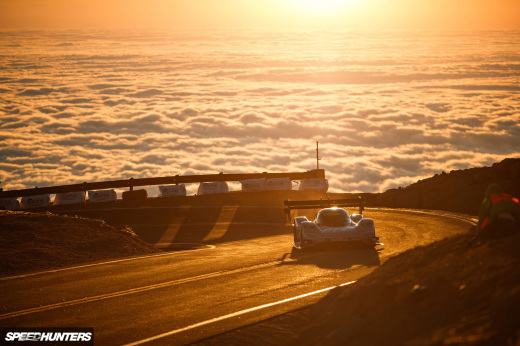 I was national champion and I did well for myself, but yet Pikes Peak was always the aspirational race. 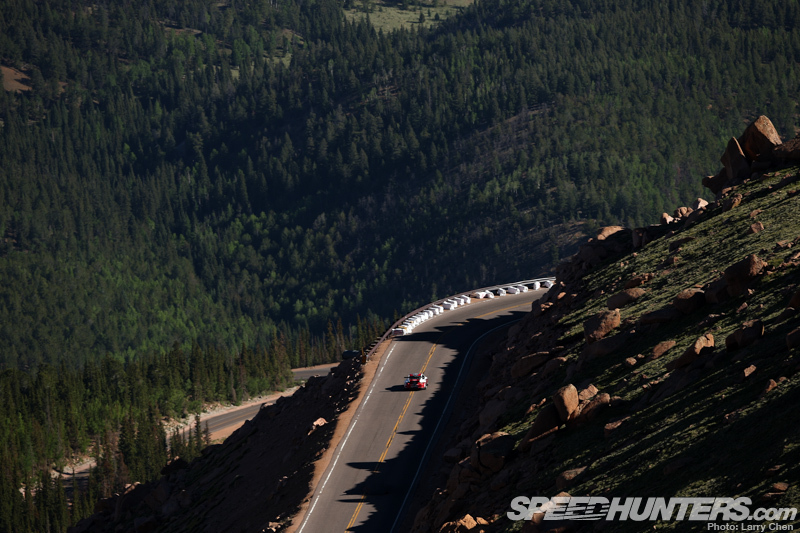 There was this national series I was competing in, and there was the internationally-renowned hill climb event that was held at Pikes Peak. I was attracted to it because of that. 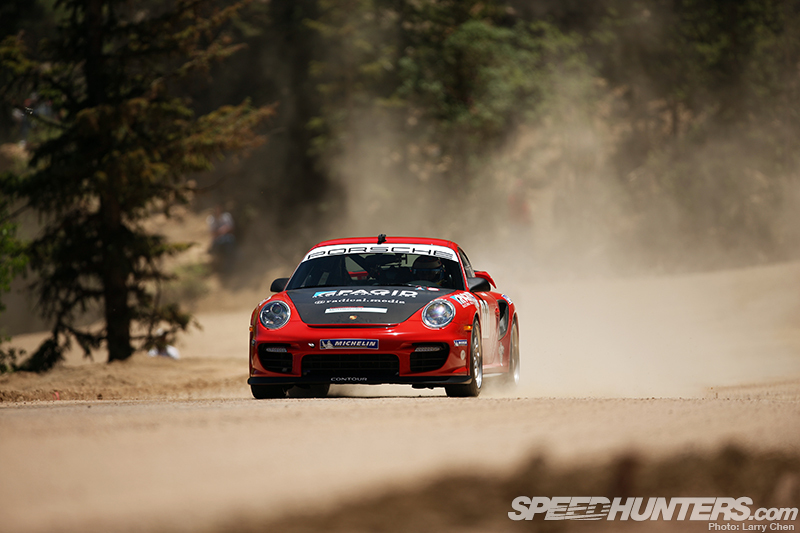 Then, if you look at the twelve and a half miles we got to race over when it was dirt, it was every type of rally dirt corner offered in the world. From high speed stuff, to tight hairpin stuff, to extremely technical flowing stuff. It was little bit of everything all combined into 12 miles. 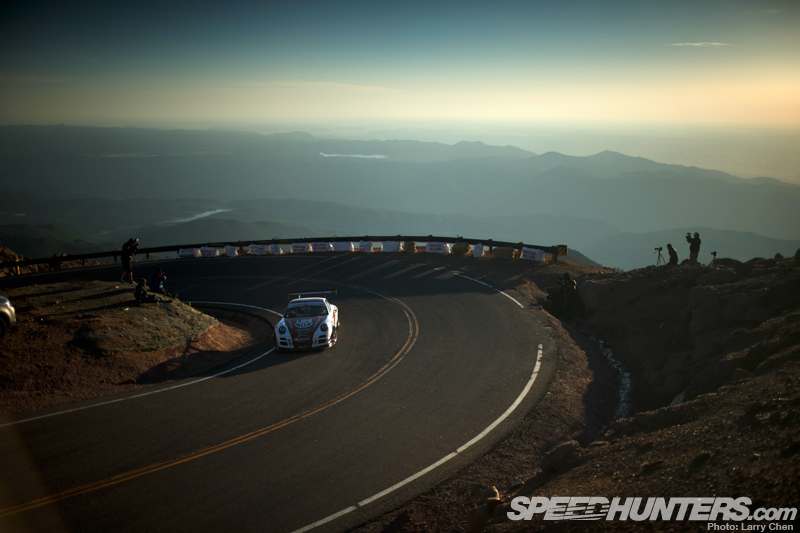 I’ve always termed it as something similar to Nürburgring, which is approximately the same length with about 15 less corners. Nürburgring has street characteristics: fast and flowing, tight and technical, and then stuff that you just let it fly on. 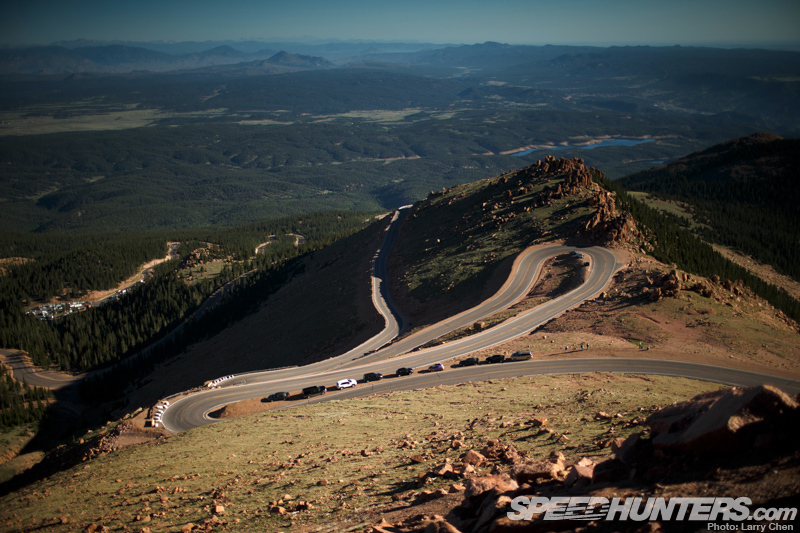 And that’s really what Pikes Peak has. The bottom is kind of that technical, moving back and forth. There’s the Ws, which is just point-and-squirt to each one. And the top is fast and flowing. It’s a very cool event because of the nature of the track. The other side of it is that it’s a place where low tech meets high tech. When I first started running here there’d be locals that ran some open wheel or stock car, and they’d be vying for the overall win. Then there’s Rod Millen who shows up in 1994 when he ran the Celica, and went head-to-head with Robby Unser driving this open-wheel, big-wing car. And the record was established at 10:04. 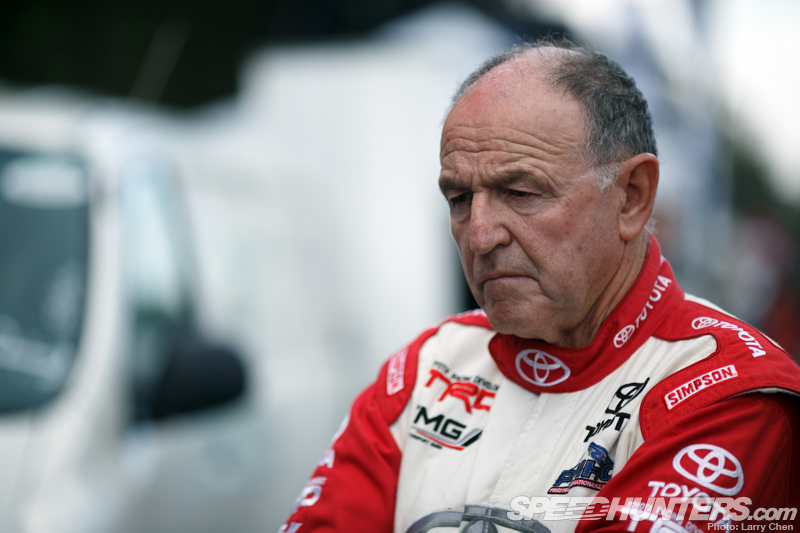 But Robby Unser ran a 10:06 in a car that was as diversely different to what Rod was running. I love that. I’ve come here with biggest horsepower things and won, and I’ve come here with the smallest horsepower things and still won. It goes back and forth. 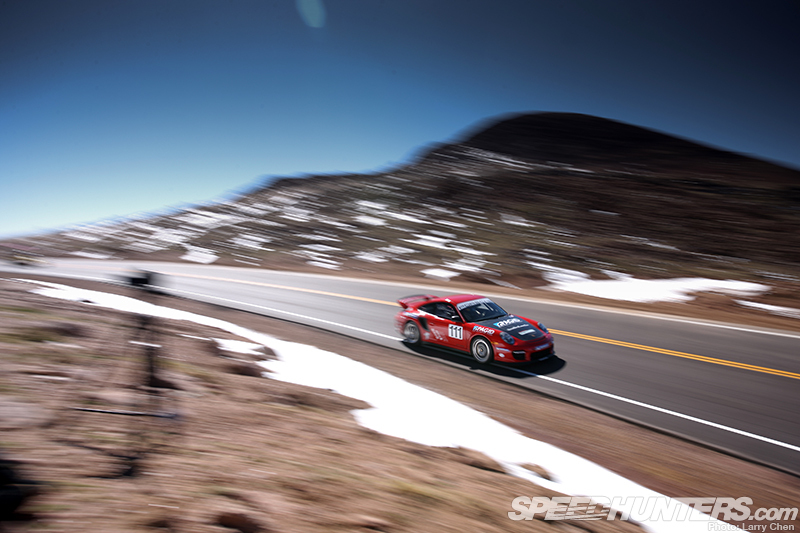 There’s such a challenge in the mountain itself that the automobile you’re in doesn’t matter as much. That was true when it was dirt, but now that it’s paved, it’s a different world. Larry: This is your first year driving it when it’s fully paved and therefore on slicks for the first time. Looking from the outside, I think it’s a lot more dangerous than it’s ever been. Jeff: Yeah, as I said, my background is rallying and so I was always most comfortable in a car that was moving underneath me. It’s weird that sliding felt more comfortable than driving straight because you always felt like you could put it where you wanted it. In the dirt days we constantly drove past the limit of adhesion. We’d brake into a corner, pitch it in and then we would drive it on the throttle when it was pointed the right direction. That was kind of a generalization of the way we went about it – but we were always past the limit of adhesion. Now in the pavement days, we’re trying to find a balance where we run right to that limit of adhesion and not past it. Therefore, when something went wrong in the dirt you were already slipping, so there wasn’t a big release of energy. 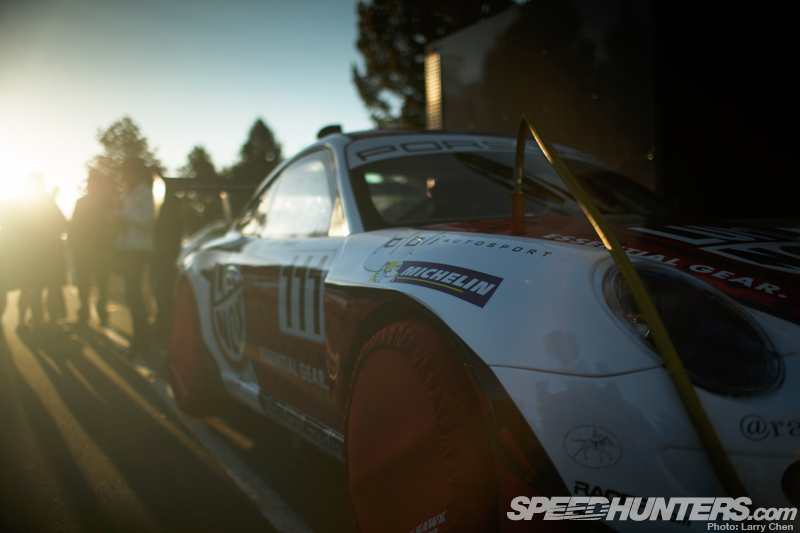 In road racing on slicks when a car goes past that moment of the limit of adhesion, there’s a step away – a release of energy that almost speeds the car up. So it’s a totally different thing because the course is not gotten any wider. In fact it’s gotten narrower. The space in which things happens is 30 to 40-feet wide – that’s it. It’s a really different experience. When I drive there the goal is to stay on the road. The feeling of bringing it right up to the limit is a different type of pressure than you had when you were running in the dirt. 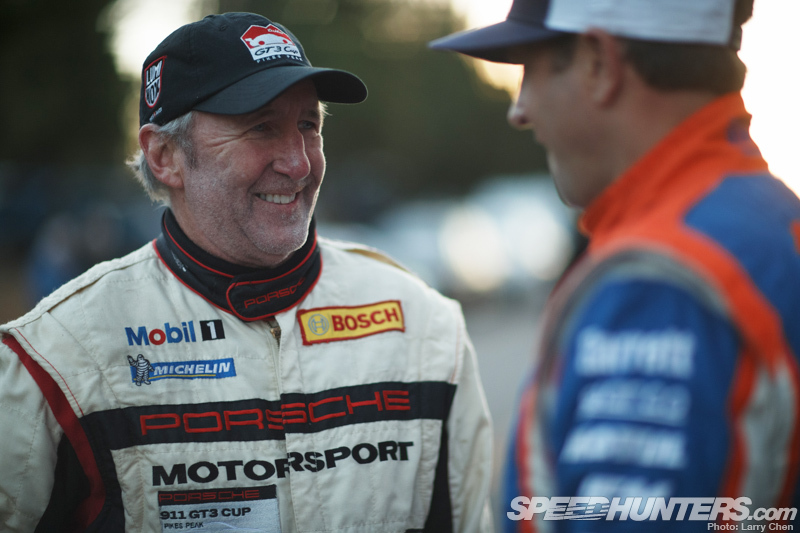 Larry: So this year you’re running the GT3 Cup car. 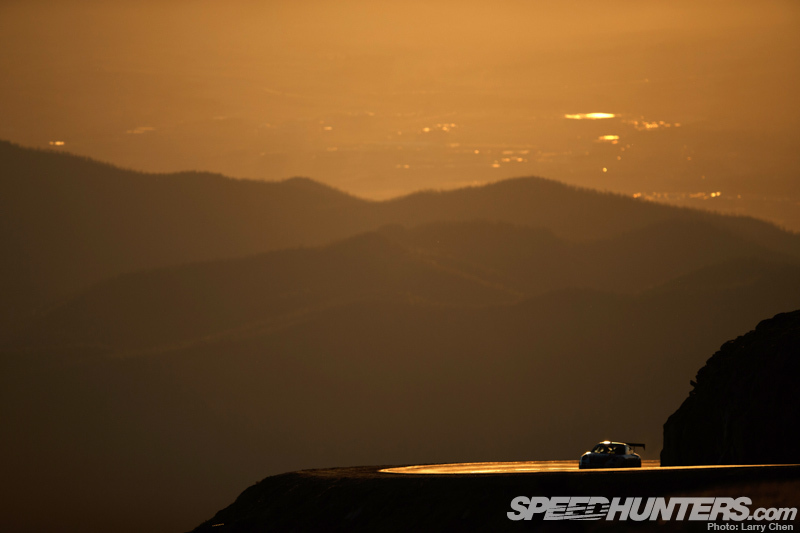 Is it more powerful than anything you’ve ever driven up here? 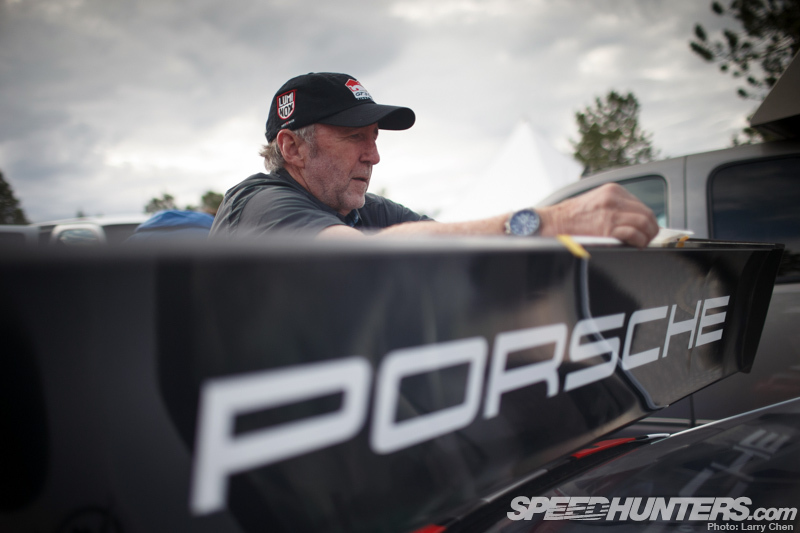 Jeff: Here’s the deal, it’s probably close to the same power as I ran in the GT2 RS. It’s just being delivered through a road racing shell. I have a sequential gearbox with short straight cut gears and suspension that’s really for the pavement, so everything feels much, much faster. 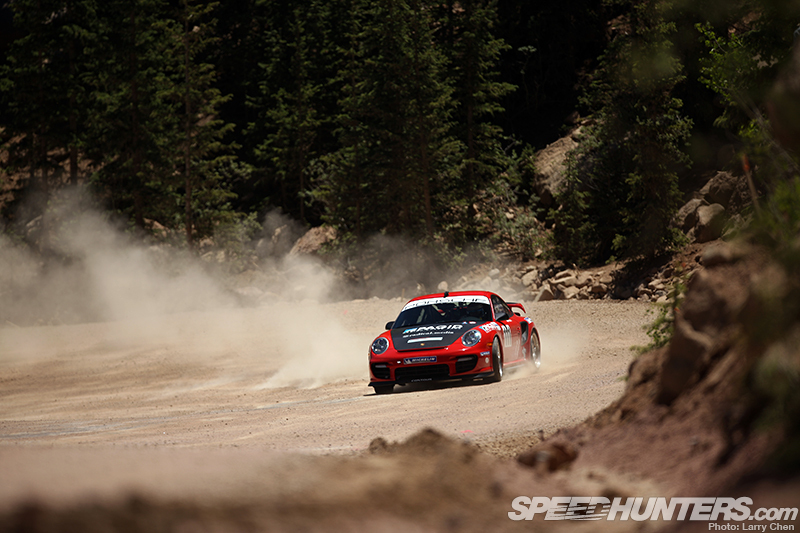 When I drove the GT2 RS here, it was [geared as] a 200mph-plus car. 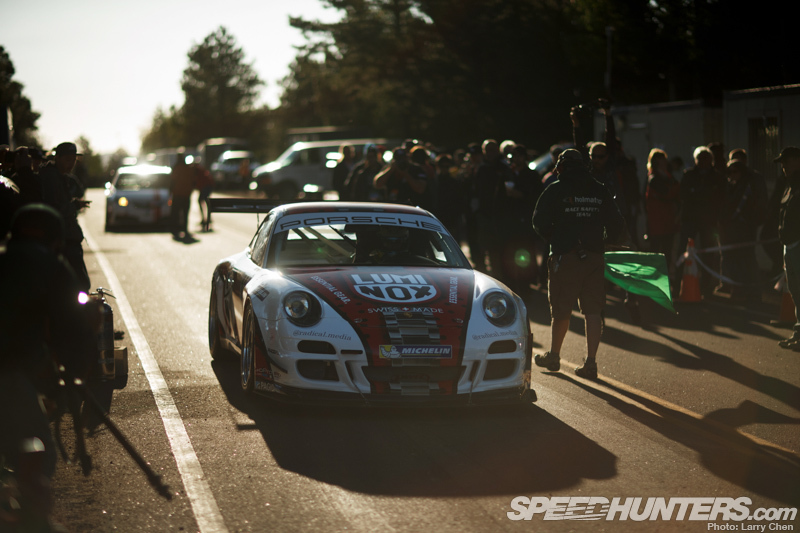 When I drive this car here, it’s a 135mph car – so you’re a lot busier. I essentially drove the GT2 RS as a three-speed, but in this car I use all six gears. Larry: I’m sure it’s going to be hard for you to really explain, but what does it feel like now that you’re going that much faster. Are you a lot more focused now? Jeff: It’s just that everything happens so fast, but the car itself is a car you feel like you’re wearing rather than just driving. You don’t feel like you sit down on that car and you drive it, you really do feel like you’re wearing it. And because of that, things that are happening really fast. But it feels like an extension of you. It’s funny because two nights ago, I just touched my hand, and thought why does that feel sore? And it’s just the bruising in my palm of pushing the gear lever forward going down to the gears. If you look at some of the hairpins that I run between, I’m 1st, 2nd, 3rd, 4th, 5th, 6th, back to 5th, 4th, 3rd, 2nd, 1st. 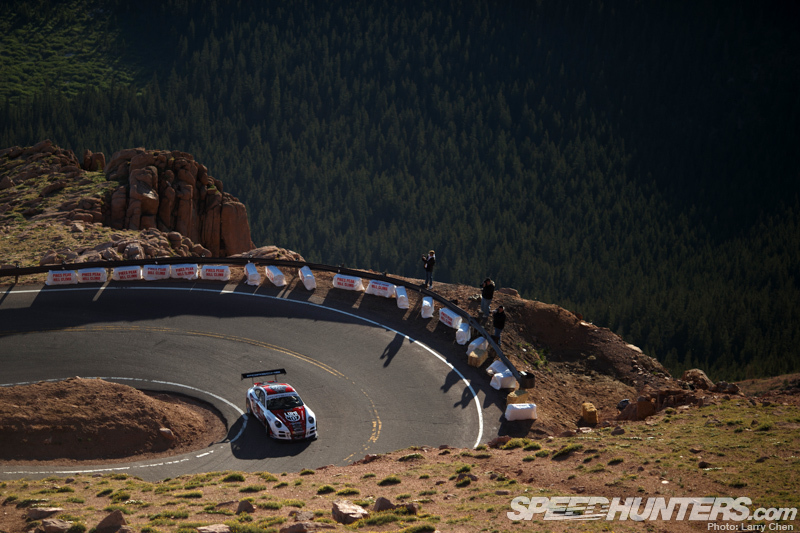 That’s just between two hairpins. So it’s a lot going on but because you’re flat shifting, not lifting off the gas pedal and not using the clutch. It happens kind of seamlessly but you still have to move these things. Larry: I notice when you’re just coming out of the W’s you’re shifting basically right as you get out. In my mind it’s kind of like you are moving the ground beneath you because of how much power you are putting down. Larry: We talked about this a little bit before, the fatigue, the hours, we both have to deal with it. Because I am following what you are doing, we both have to deal with it. I already have a hard time with the headaches and just trying to get stories out, working on pictures, just being there on the side of the mountain at the right time. How do you deal with it? 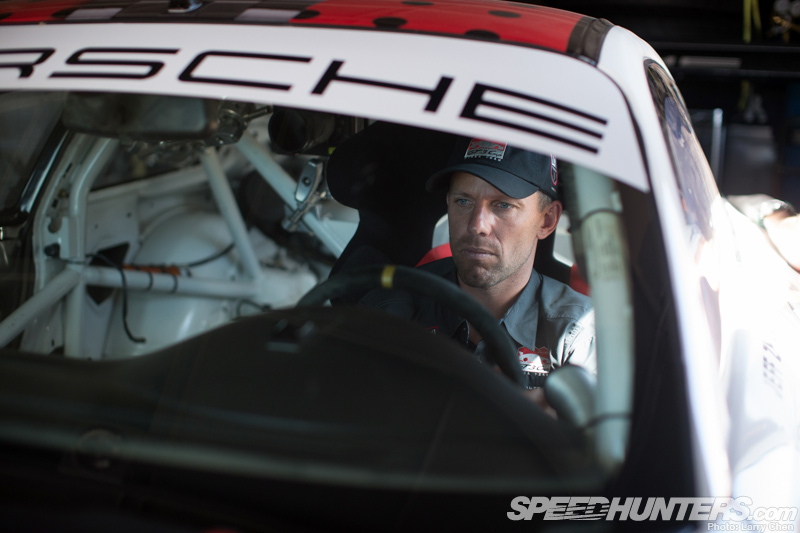 Jeff: The difference is that I really feel like I’m on my game when I’m driving. But it’s such a combination of adrenaline, and focus, and it’s kind of like cause and effect. I mean, this car is hitting redlines over and over again. There’s such a sensory overloaD going on. So the last thing you could be is tired. But the rest of the day really takes a beating on you and by the third day, you’re just wiped out. I was just going to say too, the car does things a certain way. The 911 is the most developed sports car in the world and this is the competition version, so it’s even developed further. The fact that it’s rear engine and the weight’s over the rear end, you’re able to put the power down in the slow speed corners and kind of really rocket out of them. It’s really a pretty phenomenal package. Because I’ve had experience racing with the Cup car and experience racing the GT2 my goal was to blend those two cars together. 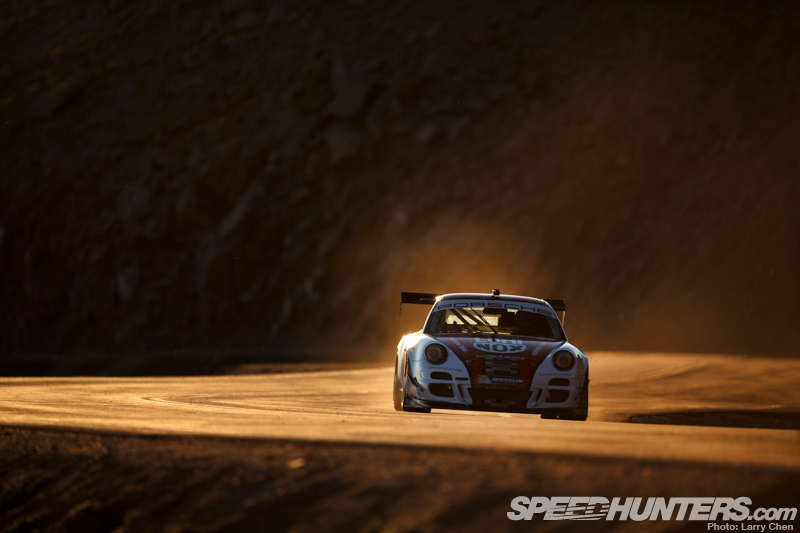 Take the chassis and the balance and the wonderful competition car nature of the GT3 Cup car, and combine the power I experienced in the GT2. Thing is, I’m trying to deliver the power from sea-level all the way to the summit, and that’s what we’re doing. So you can see though by doing that, we’re not changing the balance of the car. It still feels like a sea-level car. 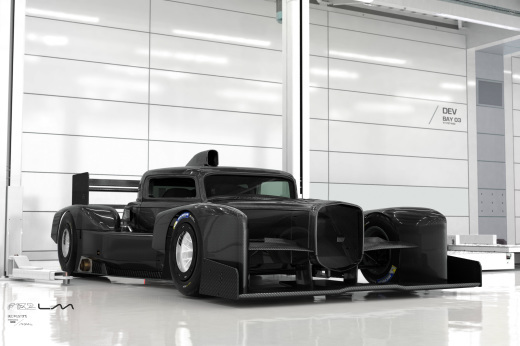 If I had run 800hp through it, it would have changed everything. The tires wouldn’t have put the power down and the transmission would have been a possible weak link. There’s so many things to do. We just wanted to deliver sea-level power all the way up. 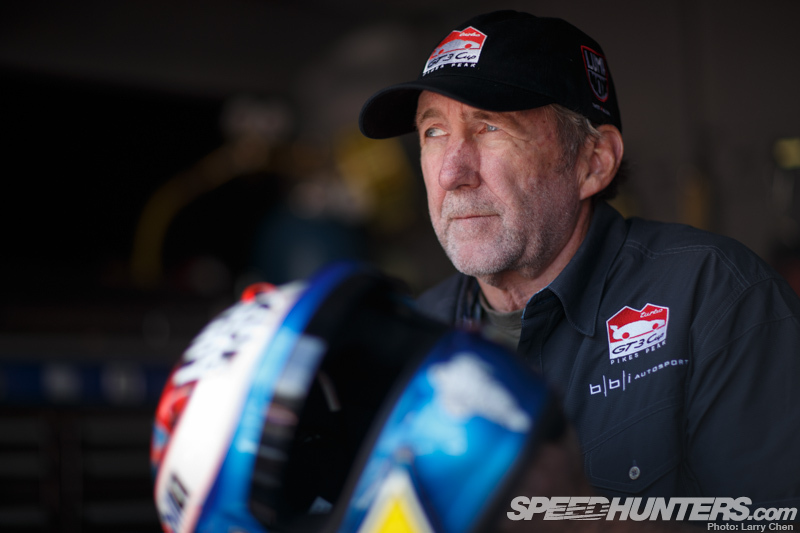 Larry: That’s interesting that you mention that because one of the things that I noticed especially watching the 2011 videos of Monster Tajima going up the mountain, from the starting line, his throttle is super touchy, hitting red line all the time, just spiking once he hits boost. And once he was kind of near the top, he was so much slower. I don’t know, maybe he was just kind of easing up on it because he was getting to the end? I’m sure the altitude just affected it so much, that’s kind of one of the things they put into consideration. Now you’re getting to the point where you’re tuning the car for it to be exactly the same from start to end. 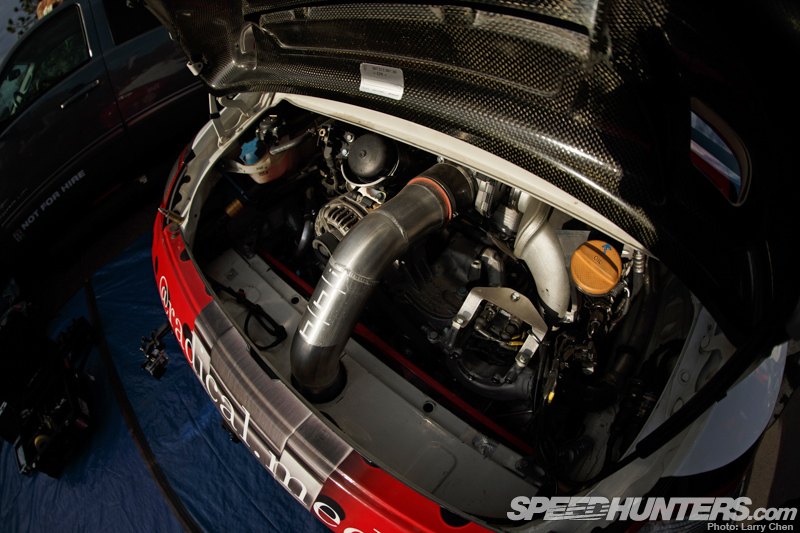 Jeff: BBI has been responsible for some very high horsepower cars, and that’s not what I was looking for. I was looking for what I just described; keeping the balance of the car but delivering the horsepower from sea level all the way to the top. And that’s what we’ve done. That’s what BBI is very good about – understanding, and making it work. Larry: So compared to other types of racing, is this really the only race where you really have to deal with the altitude? Jeff: Yeah, I’ve encountered altitude in different ways in different parts of the world. I did the Panama-Alaska race which was 25 days and 11,000 miles in the 914. We had different carburetor jets in the glovebox and were literally changing them in Mexico to go to 9,000 feet. It’s just a different world to everything being managed electronically. 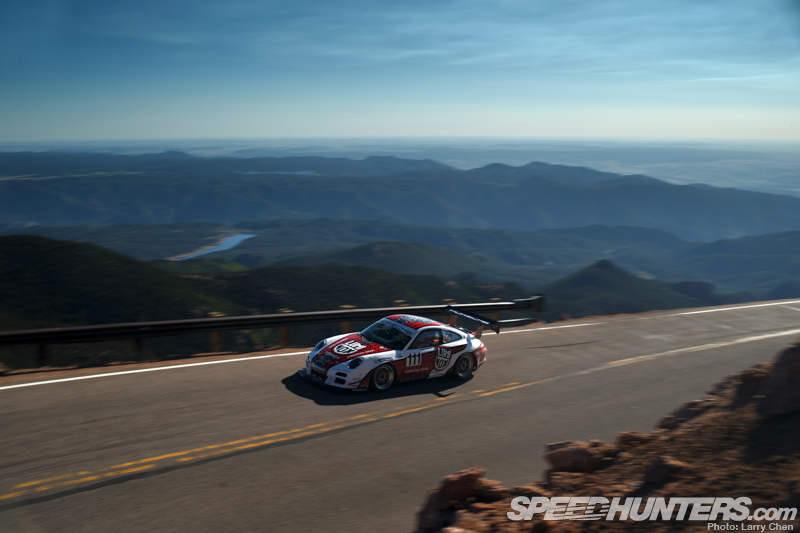 Every car I’ve ever driven at Pikes Peak – except for the GT2 RS – I’d started waiting on it at the top. Especially that last run, that Cog Cut – it’s like, ‘Okay, we’re going to get there, we’re going to get there’. It’s just such a funny feeling, it’s kind of the opposite of the experience you should have. It should really be the slow at the bottom so that you get warmed up to get to the top, but it’s the other way around. Larry: So how does that affect you? Can you tell? Obviously when I’m out there, just bending over to pick something up, I’m just winded. How do you deal with it while you’re driving? Jeff: For 12 of my years of competing here I was living in Colorado at almost 9,000 feet. Coming here was no big deal. Then the last few years I’ve been living in California, and coming here I’ve noticed it [my tolerance for the altitude] slipping away. This year, when I’ve got to the top, I’m always winded. I’ve never worn oxygen here like Rhys and Rod do and all, but that was because of my altitude thing, I just didn’t feel affected by it. But this year I’m feeling it more. But I’m feeling it for two reasons, one is, yes, it’s been awhile since I’ve lived in high altitude, the other thing is, this car demands a lot more from you. It’s funny because I’ll get to the top and sometimes I’m just panting, and other times I feel pretty good about getting up there. I look back at the run and what caused it. There’s usually something in there that set you off from the middle of the run, that you probably got caught up breathing-wise. Fitness-wise I feel like my strength and agility and reactions are really all there in a good way. I think it mostly has to do with the car – it demands a lot out of you. 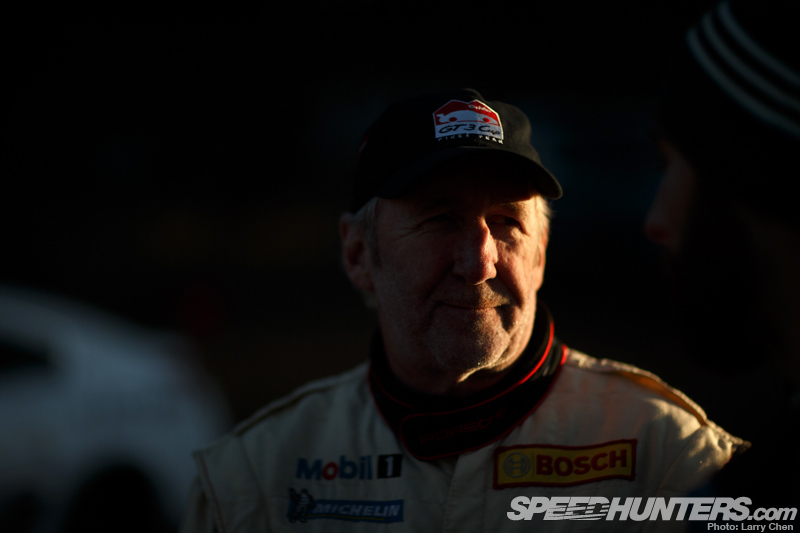 Larry: I remember talking to sports car drivers driving Nürburgring, or Spa about this. 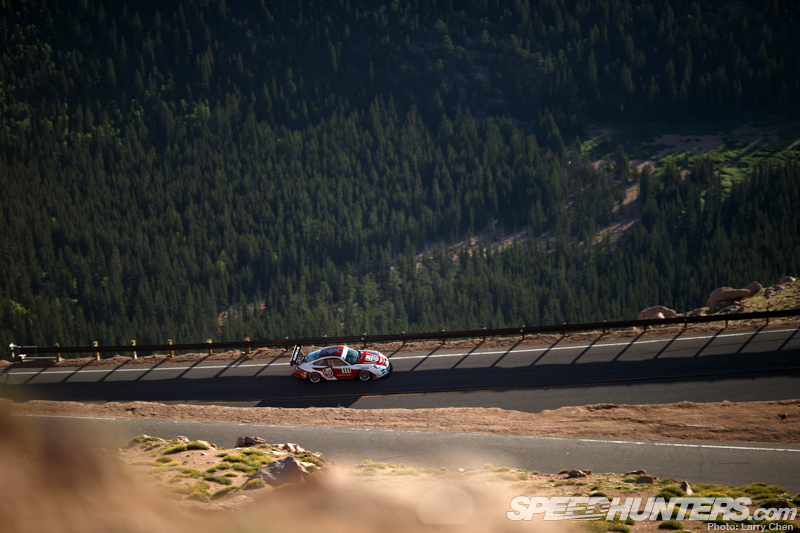 They have times they get to rest on straight-aways or pit-stops and the rarely go ten tenths to keep the car out of harm. Would you say you’re going ten tenths the entire way up the mountain? Jeff: Yeah, but only on race day. Race day I drive entirely different than I did all week. If you look at my times, it shows that I care nothing about being the fastest during the week. The thing that I care most about is that every run is faster than the last one. And all week long, every run has been faster than the one before. That is critical to me because I mentally break the mountain down, in that I only work on line for the first two or three runs. It’s been weird this year because we only got two runs on the bottom, so it’s been a little bit different. I’m not thinking about going fast or anything, only working on line. Line was not as important when it was dirt, but it’s much more important this year. 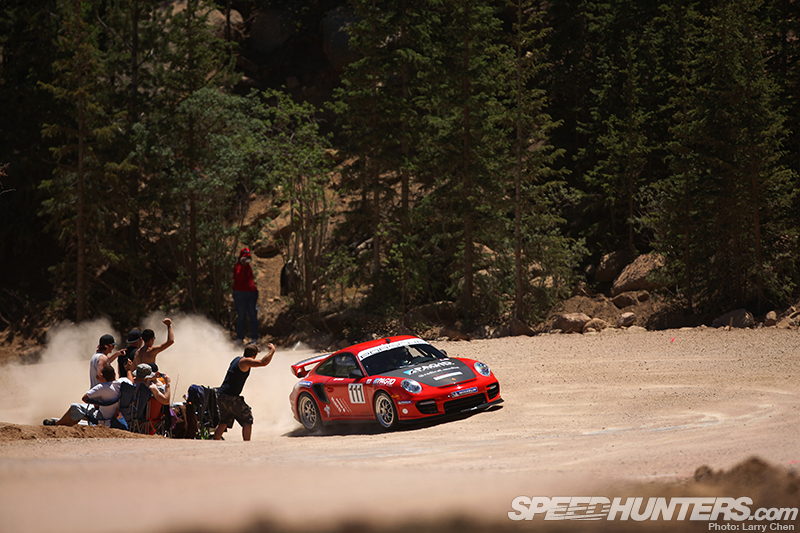 In dirt we search for the cleanest parts of the road. The last thing you want to do is set yourself up to come through a beautiful corner, on a beautiful line, and accidentally hit the dirty, slippery stuff. So you’d always hunt for the clean lines, even when it’s an effort to stay in them. Here we’re back to road racing; I’m looking at line and the funny thing is it’s turned out to be so critical because we’re carrying so much more speed than we ever did. So as soon as your line is off, you’re like, ‘what am I doing over here? Why am I so close to the edge?’, or not the edge even, but just that little gravel part on the edge. You’re constantly checking yourself that way. And you know a typical race track is nine corners, this is 156, so line is critical. All I really work on is line and then putting it together in the last couple runs. I never leave any section without thinking I can go a lot faster the next run. Larry: I have to ask, are you a robot? Do you have emotion? Meaning when you’re going for your single run, and this is your first time running on pavement? How do you think you’re going to feel on race day? Are you just going to forget about everything else and drive like you normally do? 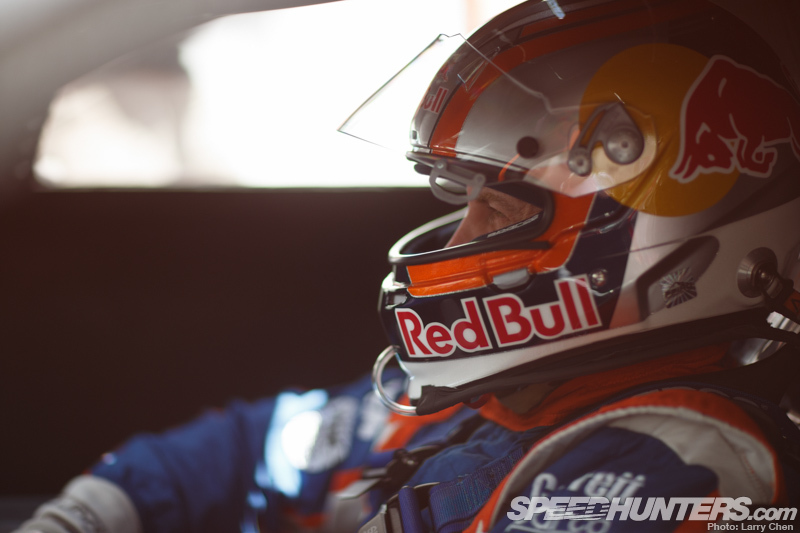 I talk to a lot of race car drivers who say, ‘Oh I don’t get nervous at all ever because it’s out of my system, this is just what I’m programmed to do, this is what I trained my whole life to do.’ What is it like for someone like you who is not a professional racing driver? 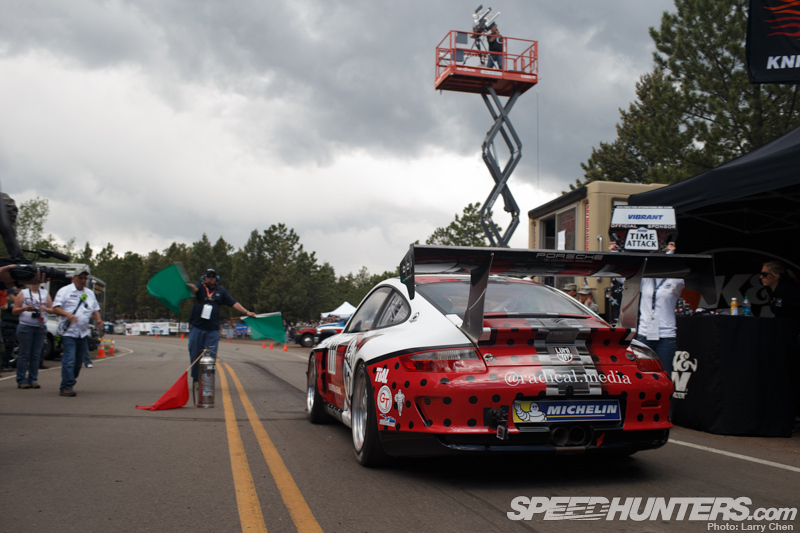 Jeff: For me, I can’t lose sight of the fact that I haven’t driven at Pikes Peak for two years. I kind of keep that there in my mind, so that I always have that little bit of gauge or barometer that kind of says you need to be cognisant of that. I try to mountain bike as I consider it great for fitness and great for reading the road. I really do try to get in shape for this event. I also often drive shifter karts too, because you keep so busy in one of those like I do in my car. But when you ask about how does it feels when you pull up to the line, there are a lot of things. This is a new car for me to drive, but when you sit in this car, reach your hands out and grab a hold of that suede steering wheel, it feels exactly like my old car. As soon as you leave the line though, it’s nothing like it. It has a different torque band – a different power band – and it has different sounds inside. If you saw that in-car video we did two weeks ago, you’d know that the sounds are insane. You have to put all that out of your mind but it’s funny it just feels so different. When I come up to the line, I think about the car. 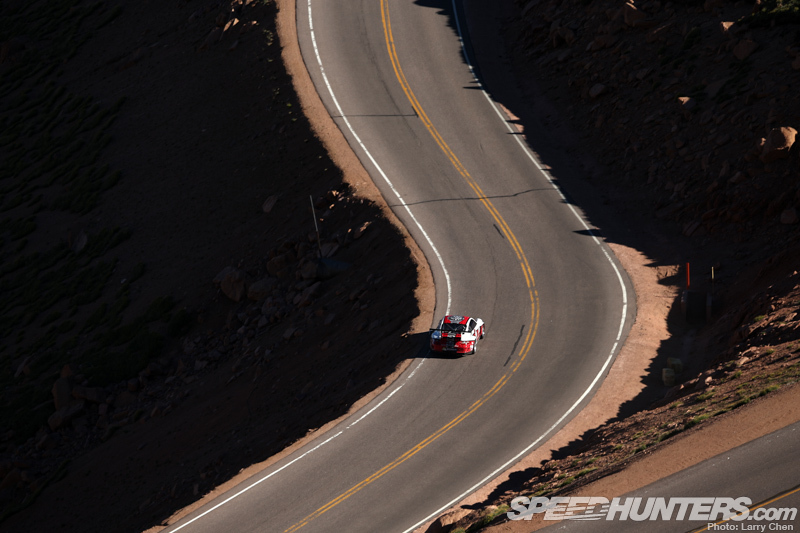 At Pikes Peak you think about the weather, and what the road conditions are – you think about the cars that went off ahead of you, you think about where potentially there might be gravel, you listen to make sure there’s no incidents ahead of whether someone has dropped fluids on the race line. Two years ago, just before I left the line they said there’s a whole bunch of coolant down at the entry of Bottomless Pit. Well Bottomless Pit is one of the fastest parts of the course. When you come down that left, you just let it flow and you’re flying. I had all that knowledge and I got in there and I saw it even coming, and I was set up on the left side of the road and it was dead center and I had to cross over through it. It was so weird because you were totally prepared for it, but it was still something you could barely deal with coming in at speed. There’s so many things that you’re getting [through the radio], the weather, the road conditions, and then the car for me this year is so different. I think that’s what creates the nervousness. But when I leave the line and I pull second gear in that car, that all kind of goes away. I think that if there’s one mode I have. it’s ‘attack’. 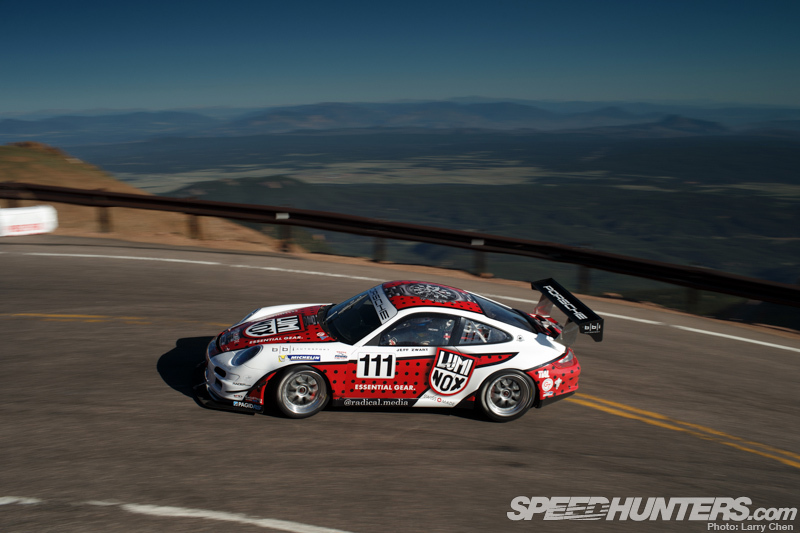 Really attacking everything, waiting to brake deeper, and looking to carry the most speed through the sweeping turns. When I first started this week, I was braking too early for everything and so that’s been a challenge because all our braking zones have changed, all our speeds are way up. The other side of it is carrying the speed in the corners. I don’t have a lot of experience on slicks. Driving to that absolute limit that I talked to you about, that’s a big deal as is getting that confidence to run right up to the limit of it. 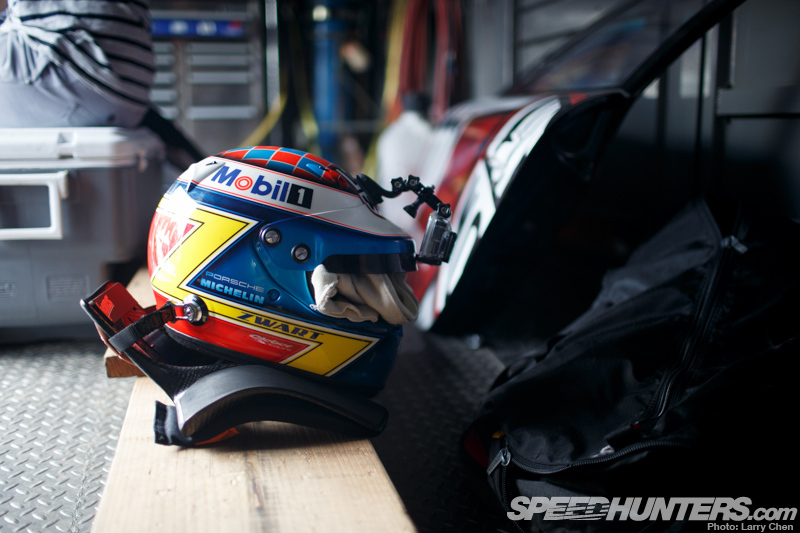 That’s where my time in the car has been really good, to not only understand the car, but to understand the slicks. This package we’ve put together with BBI it’s pretty incredible, and is single handedly the most fun car I’ve ever driven in. 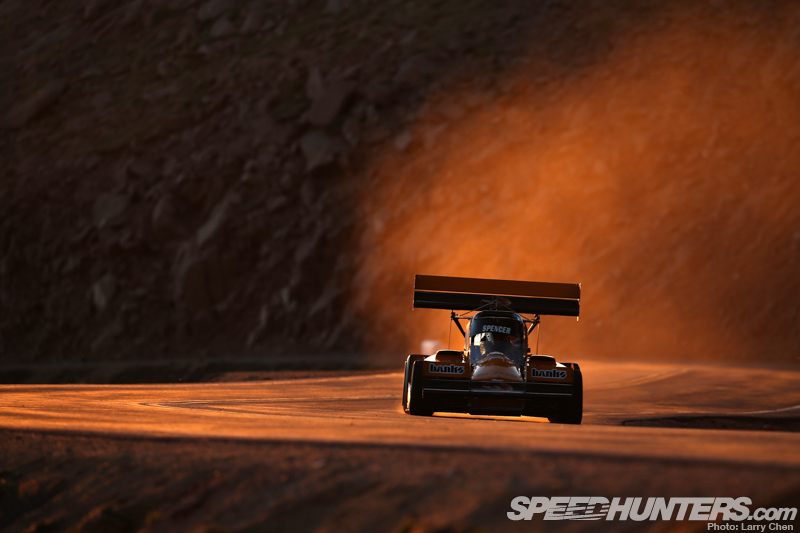 When I went to Willow Springs the first time to test it, you asked that question – ‘What is it going to feel like?’ That’s what was going through my mind for months, and I really thought it could be relatively intimidating because some of the turbo cars I’ve driven here have been that way. The GT2 I drove in 2002 was probably the most intimidating car I’ve ever driven here, because when the turbos came on it just lit up. I didn’t know what sort of car to expect, but like I said, the Cup car is something I feel I wear. The day I drove it felt so comfortable, and then to combine that with power and the kind of sheer, almost violent, experience of driving it is just super cool. It’s one of those cars that you can just cruise around with and it feels okay, but when you come on with it and hit ten tenths, it’s pretty awesome. You feel like sometimes you just step up your game and the car needs to step up its game, but I feel like we just go together. It’s a really cool feeling. Because of my rally background, you drive, you brake, you pitch, and when it’s going the right way, you’re flat to the floor again. There’s a really nice transition of half throttle too, it’s totally driveable. Larry: I see, so when you’re saying about the way the turbo car will act. Say when you’re in the corner and you’re half throttle and then it hits boost, is it easy to loose the rear end in that case? 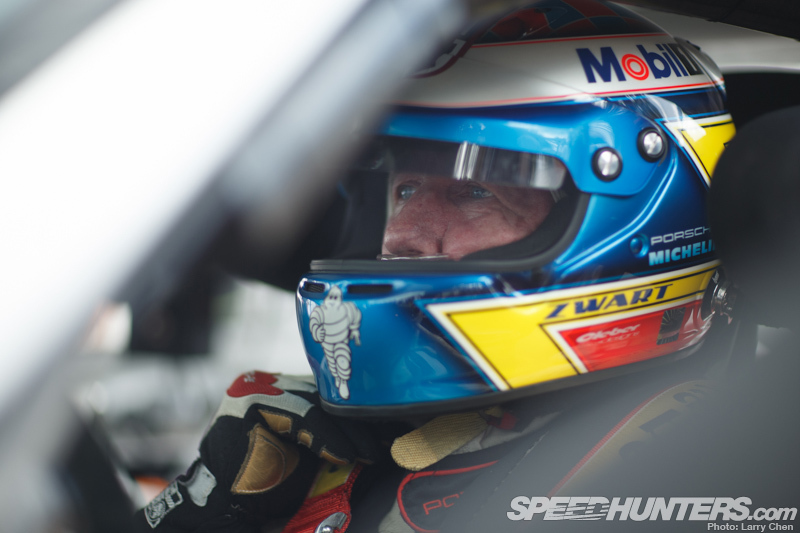 Jeff: Right, well my driving style was always to set the car and then drive flat to the floor on the throttle. I found out right away during testing at Willow Springs that you didn’t just go full throttle whenever you wanted to. What was so cool was the modulation; the areas between flat to the floor and not flat to the floor are so beautifully matched. So it was mind over matter for me. 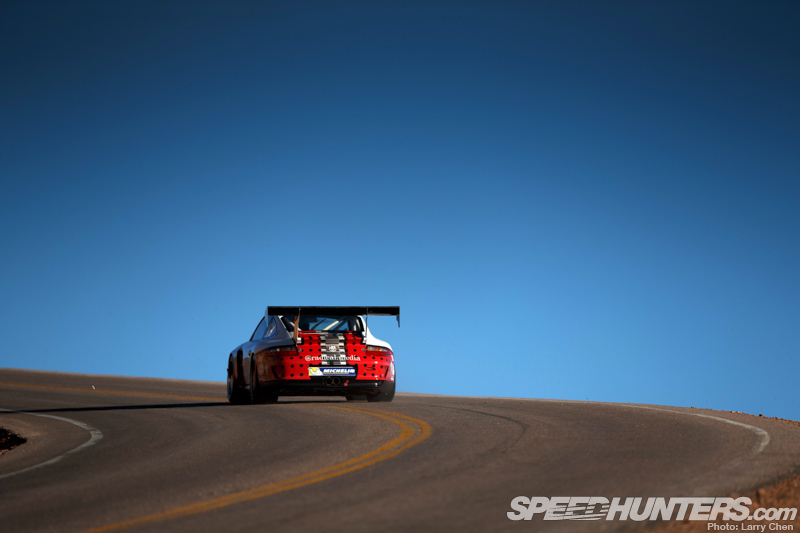 Especially when I left Willow Springs, I was thinking, ‘Okay when I get to Pikes Peak, I got to work on this’. That wasn’t my driving style; I’ve always answered my problems with going full throttle.